This is the painting I have been working on, another of my "Mountain Daydreams," landscapes painted in acrylics on aquabord. 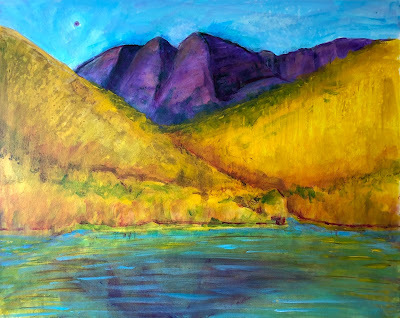 This painting is based on a specific place, the Maroon Bells near Aspen. Yesterday I realized that given the vantage point, I needed to include Maroon Lake, so I worked on that, borrowing some techniques that I have used in my oil bar paintings. (Like George Constanza in Seinfeld, I am a bit freaked out by the collision of two worlds: in this case, my oil bar painting and my acrylic watermedia paintings.) This morning, I started by straightening out the shore line, which improved the composition right away. (Browsing through the many, many stock photos of Maroon Bells helped me see that the apparent curve of the shoreline is an optical illusion caused by the reflection of the hills.) I also added some red-violet to the mountains, actually going for maroon. I also added a bit of outline and some pale yellow to add light to the mountains. And I adjusted the shapes of the yellow hillsides. Finally, I added a yellow wash to help the two hills "read" as one horizontal band. I have made many other tiny changes all day, and no doubt I might make more. But now I am ready to call this one finished.